In keeping with this week’s focus on classic foods you can prepare using tortillas, today we’re going to focus on another longtime favorite: tortillas. In this case, these tortillas come with the cheese but also happen to include some tasty sweet pepper and chile roasted squash. Let’s begin with the ingredients. Begin by preheating your oven to 400 degrees Fahrenheit. 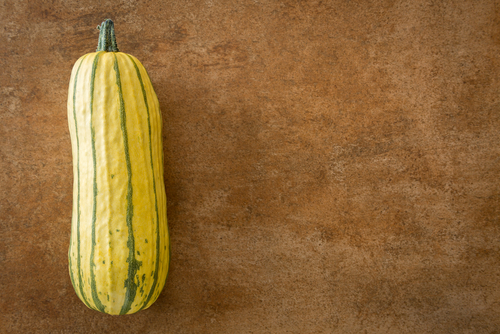 While it’s heating up, cut the delicata squash in half, remove the seeds, and slice it into pieces of ¼ inch. Grab a large bowl and combine the onion, squash, and pepper. Follow by adding the cayenne, oil, salt, cumin, ancho, paprika, and chipotle and then mix until the vegetables have been coated evenly with the spices and oil. Use a baking sheet to spread the vegetables in a single layer and then roast until the squash is tender and crispy, it should take about 25 minutes or so. For the quesadilla assembly, place four of the tortillas on a surface and top each one with a pair of tablespoons of grated cheese. Evenly decide the roasted vegetables among each tortilla and top with whatever cheese is left followed by the last four tortillas. Use a skillet over medium heat to cook the tortillas until the bottom is golden brown. Flip it over carefully and repeat for the other side. Cut the quesadillas into quarters and you’re ready to serve. Are you trying to spice up your breakfast options with a greater degree of variety? If so, you may want to try this quick and easy ten-minute breakfast burrito recipe! Without further ado, let’s get started with the essential ingredients. To prepare the salsa, mix the ketchup, tomatoes, and onions together and then set it aside. Now grab the mushrooms and vegetable stock and simmer in a saucepan for about four minutes, making sure to stir every once in a while. Use the cooking spray on a medium non-stick saucepan and beat the milk and eggs together before placing them in and scrambling them over medium heat. Once the eggs have set, remove from the heat. Use a hot frying pan to individually warm the tortillas, making sure to flip them over after a couple of seconds. Lay each one on separate serving plates and fill them with the drained mushrooms and the scrambled eggs. Fold them up to create the burrito and you’re ready to serve along with the tomato salsa you made earlier. 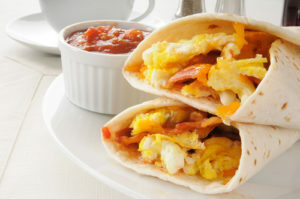 This update or recipe is provided by tortilla company Easy Foods Incorporated. Our wholesale tortillas products include corn tortillas, flour tortillas, tortilla chips, and wraps. 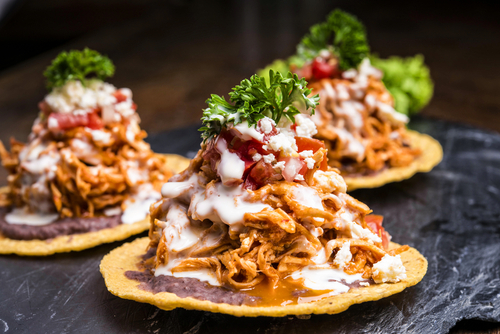 For more information on our services such as tortilla customized branding or brands like Tacomex and Vedgee or private label tortillas, please call 305-928-1593. Our business hours are 9 am to 5 pm Monday through Friday Eastern time and we are closed on weekends. It’s not always easy to find a meal that packs as much protein in it as it does flavor. 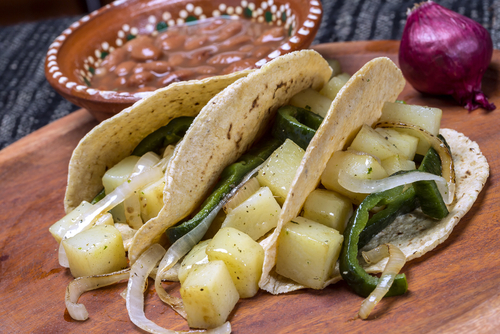 This crunchy potato taco recipe is just the right thing to fulfill both of those needs. Here’s what you’ll need to make four of them. To prepare the tacos, begin by using a deep skillet over medium-high heat to heat the oil. Warm each tortilla separately to make them soft and then add a ¼ cup of the mashed potatoes into each one before folding them. Fry the tortillas in the oil until both sides are golden brown. Move them over to a paper towel-lined sheet and season them with salt. For the sauce, use a skillet over medium-high heat to heat the venison and the oil and continue to heat until the meat has become golden brown. Place it aside for now. Use foil to wrap a skillet and then place it over high heat. Add the roma tomato, tomatillos, garlic, and the two jalapeños and then char them for about ten minutes. Use a foil packet to heat the chile de arbol for about thirty seconds. Once that’s done, place the ingredients in a blender and throw in some salt and cilantro. Mix the sauce with the venison, heat it for a minute, pour the mixture over the tacos, and you’re ready to serve. You can also sprinkle some aged cheese on top. If you’re Hispanic, you’re probably familiar with the tastiness of tostadas, a cooked tortilla that undergoes additional cooking in order to make it nice and crispy. Toast it, deep fry it, no matter how you have it, we’re going to show you how to make some of your own. Let’s get started with the ingredients. Begin by shredding the roasted chicken breast and then placing it aside. Slice half of the onion into pieces of ¾ inches and then chop whatever is left. Grab a pan and place the tomato, wedges, chili, garlic and the oil and then broil for about ten to fifteen minutes until the ingredients have softened and charred. During this process, go ahead and throw in the iceberg lettuce, half of the cilantro, the sliced radish, and chopped onion. Puree the onion and tomato mixture along with the seasoning and serrano until it’s sufficiently smooth. Move it over to a bowl and stir in the chicken you placed aside at the beginning along with whatever cilantro is left. Add some pepper and salt for taste. Using a medium skillet, heat a cup of oil over medium heat until it begins to simmer. Using one tortilla at a time, fry each one making sure to turn them over once or twice using tongs until each one is golden brown. The process should take about forty seconds or so per tortilla. Drain the tortillas for a moment on a paper towel before moving them over to plates. Spread the refried beans over each one and top off with the chicken mixture you made. Slice the avocado, dollop with the sour cream, place the lettuce mixture, sprinkle the cheese, and you’re ready to serve. Begin by preheating your oven to 425 degrees Fahrenheit. Use three heatproof ramekins and butter them up generously before placing them inside a pan with high sides. Grab a tortilla and brush some of the melted butter on one side of it and then sprinkle it with cinnamon. Flip the tortilla over and repeat the process for the other side. Place each tortilla on the ramekin carefully and gently fold so it fits. Don’t worry, you don’t need to be perfect. Do the same for all of the tortillas you’re using. Bake the tortillas for about ten to fifteen minutes or until they begin to turn a golden brown. Remove each one from the pan and let it cool to room temperature. 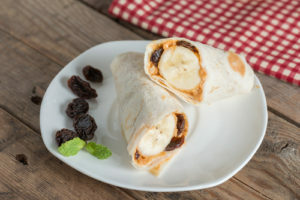 Once it’s sufficiently cool, grab a spoonful of the pudding and place it in the center of each tortilla “bowl” you’ve made, topping it off with whatever fruit you chose. Are you in the mood for a new tortilla recipe? Look no further! 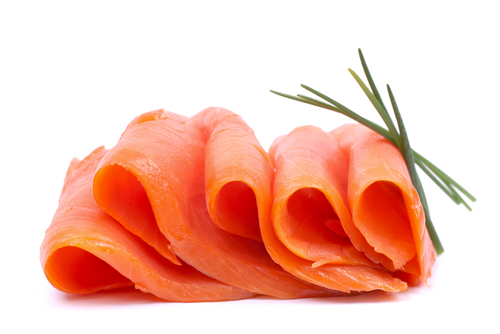 Today we’re highlighting yet another twist, this one involving tortillas with smoked salmon and avocado. To get started, begin by halving, stoning, and peeling a pair of ripe avocados. Place them in a mixing bowl and then crush them using a fork. Grab a few spring onions and thinly slice them before adding them to the bowl. Follow by finely shredding six large mint leaves and then finely chopping a small hot chilli, fold them into the avocado. Grab a handful of coriander leaves, tear them up, and also add them to the avocado. Squeeze some lime juice over the avocado and use black pepper for seasoning. Use a frying pan or hot griddle to toast a pair of tortillas, allowing them to brown in patches. Place each one on a plate and then divide the avocado you mashed evenly between them. 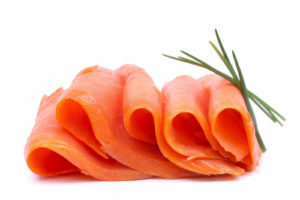 Use a couple of folds of smoked salmon on top, add some mint and coriander, a small trickle of olive oil, and voila! You’re ready to serve. Among the many adjectives we like to use to describe ourselves, consistency is one of them. We consistently strive to deliver optimum quality wraps, tortillas, and chips to our customers. That means continually researching and fine tuning our ongoing mission to create something customers will absolutely love. In case you’ve never worked with us, allow us to provide a brief introduction to the various services we offer. We’ve practically perfected our partnering ability to create tortilla food services to meet the unique needs of our clients. For food service clients, we make it a point to maximize the number of units per case while ensuring everything is cost effective. For co-packing needs, we have a team ready to work with distributors and manufacturers. We also offer private label services and customized branding, all with the time tested and premium quality that Easy Foods has become known for. Our brands currently consist of Tacomex and Vedgee. Tacomex is a retail brand featuring flour and corn tortillas, corn chips, and wraps. With Vedgee, we offer six unique flavors of vegetable wraps made with 100% vegetable puree and the freshest garden herbs. We would love to work with you in providing some of the best tortillas in the country! Call 305-599-0357 to learn more about what we can do for you. 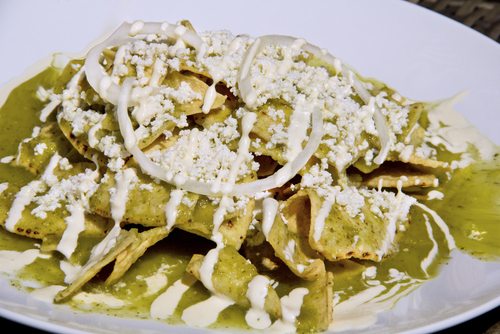 Quesadillas remain a highly popular dish and there is never a bad time to enjoy one. 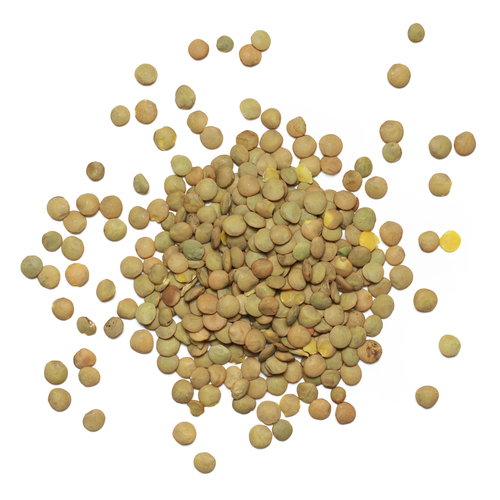 Today, we’re taking a look at a vegan-friendly option that uses lentils. It’s a perfect treat as we continue to enjoy the summer season. Let’s examine the ingredients. 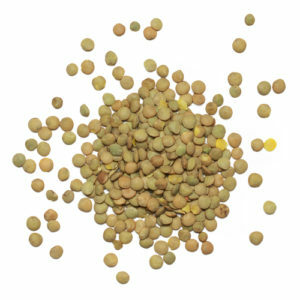 Begin by rinsing the lentils and stirring them in water inside of a medium pot. Allow the pot to boil. Once it’s boiling, reduce the heat to medium-low, cover it, and cook until the contents are tender. The process should take about twenty minutes. Drain and add to a food processor. Use a ¼ cup of the salsa and salt in the food processor and pulse until smooth. Make sure to leave some of the lentils intact to improve the texture. Fire up the grill and preheat it to medium heat. Use the olive oil spray on one side of each tortilla and sprinkle it with salt. Making sure the spray-free side is facing upwards place four tortillas onto a baking pan. Grab the lentil puree and spread a heaping ¼ cup of it across each tortilla, making sure it’s entirely covered. Follow by spreading a tablespoon of salsa on each one. Divide the cilantro and cheese between each tortilla. Cover whatever tortillas you have left so that the side you sprayed is facing you. Place or slide each tortilla on the grill, cover it, and cook for about four minutes before flipping and cooking for another three minutes or so. If the topping falls out upon flipping, press them in gently. Eating healthy should be a priority, but every once in a while you may find yourself wanting something greasy. To help fulfill your urges for something savory, this chilaquiles recipe is not only delicious but also gluten-free and vegan-friendly. Let’s get started. Begin by setting your oven to high. Use a fork or your hands to crumble the tofu and put it aside for now. Grab a frying pan over medium high heat and add the canola oil. Once the oil is hot enough, place the tortillas in and fry them for about six minutes until they’re crispy and golden brown. Set them aside on a paper-towel lined plate and season them with the chili powder and salt. Grab an oven friendly skillet, use it over medium-high heat and add half a teaspoon of the oil you used to prepare the tortilla chips. Once the oil is hot enough, add the soy chorizo and cook it for about five minutes or so. Follow by adding the red onion and jalapeño and then saute for about six minutes before adding the kale. Saute for another five minutes. Once the kale is slightly wilted, add the tofu, cumin, curry powder, and cayenne. Add some salt and pepper for taste. Cook on medium high for about six minutes or until the tofu is sufficiently cooked through. Throw in the tortilla chips and mix everything together. Use about half a cup of vegan shredded cheese for the garnish and place it in the oven for about three minutes. Use the rest of the garnish toppings and you’re ready to serve.